Fashion, Fun and Food– If you are hunting for one place that serves all three of these to you, your search is over and you have arrived at the perfect destination. 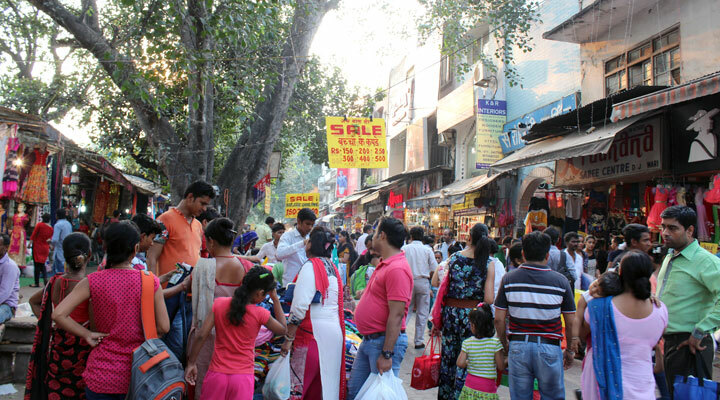 Sarojini Nagar market, although set up near the South West part of Delhi, has the always been a shopping hub for entire city and even neighboring states. If you have already visited the market you probably know about all the craziness of this place, if not, let us make you a pro before you plan your first visit. Read on these 5 Pro tips that you HAVE TO know to see yourself becoming the smartest shopper! Surprised? Yes you read it right. Do not bother yourself by making a long list that you need to buy because you’d anyway end up buying things that you will love there and they were never on the list. Going with a targeted list will take away the charm of buying a exquisite thing that you never expected to get anywhere but found here. Yes darlings, such is the variety! From superb shoes to funky flipflops, western dresses to ethical attires, from boy shorts to sarees, from hair accessories to jewellery or anything arbitrary like a lampshade or cute umbrellas. This market never ceases to surprise you with what it can offer. It is okay to feel impulsive when you find your favourite dress with a crazily inexpensive price tag but it is highly recommended that first just choose a lane and walk through without loosing your heart to every third stall. Once you had a good look across all the displayed stalls, go back to what really caught your attention. This is a fool-proof way to buy good stuff without the fear of regretting later, because your mind will only retain the things which you saw and really loved. Who says shopping doesn’t need mind! 3. Unveil the Bargain Queen in you! Bargaining is one art which some of us have in us, some don’t while others just need some practice. If you feel hesitation in bargaining try with smaller margins and in few trials you will see yourself excelling in this art. This market is really a fun place to go with friends. A quick tip: If want to be a pro at bargaining, always have your best friends by your side and see the magic of shopkeeper giving up to your whims. So go ladies unleash the talent! Right before planning a visit to Sarojini Nagar Market keeps the cash handy with you. Although lots of wise heads will ask you to relax because the place has multiple ATMs, do not fall for the temptation. It is because all the ATMs of SN market have really long queue at all times. So keeping the cash with you will keep you relaxed and have a good spree. But be very careful from pick-pockets while carrying money as the market is congested enough to make your wallet go missing. Before falling for that pretty dress and getting it packed within three seconds, take a pause. Wondering why? To double check your precious buy! More than often the shopkeepers trick with customers by hurriedly misplacing the bought piece with another or packing a defective piece. Always carefully go through all that you have bought and supervise when he packs. This will save you from shopping-regrets later on. Whether you are a Delhiite or not, if you happen to be in Delhi for any reason on the Earth, do visit this place and buy double the things in half the price. What are you waiting for! Because if there ever was an award for ‘the most visited market‘, Sarojini Nagar market would have won it long back!